Birds that fly non-stop, central heating for ants, and decoding the language of pigs – all this and more on Dear Science today on 95.0 bFM radio, or listen to the podcast on demand. We’ve all heard about amazing feats of endurance by migrating birds, and especially those that cross the oceans. Several species travel thousands of kilometres but mostly they benefit from ‘pit stops’ along the way on convenient outcrops of land. For bird aficionados the frigate bird is arguably the superstar of long distance flight, having been previously recorded to fly more than two weeks non-stop. Now new research has smashed that record by using satellite tracking and real-time biometric data to show these birds actually routinely fly non stop for periods of over two months! 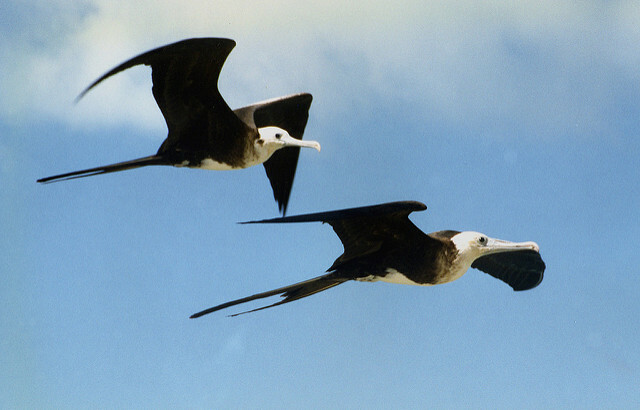 This is particularly important for frigate birds because unusually for a seabird they cannot actually land on water, in fact they even have to catch fish ‘on the wing’. A new study published in the journal Science describes how French and Canadian scientists attached high-tech sensors to frigate birds that comprised a GPS location tracker and sensors to monitor heart rate and wing beats. For birds that fly far out to sea and out of human sight this was essential to track movement. The heart rate was used to infer whether a bird was resting, gliding or flying and the wing beats measured physiological effort in flying. Birds were tracked as they flew from Mozambique in East Africa, across the Indian Ocean to Indonesia. The data showed the birds exploited trade winds (as used by humans in the age of sail) and exhibited an impressive climbing and gliding flight pattern that saw them soar to around 4000m altitude before effortlessly gliding vast distances. This finding actually poses a new research question though – because frigate birds are not downy birds how do they stay warm at such high altitudes where the air temperature is freezing? Think of ants and most people think of summer, at least in Aotearoa New Zealand they all but disappear in winter because it is too cold. Well a new study in Costa Rica shows how some canny ants have worked out a way to stay warm even in the cold of high altitudes. The research by a team at Drexel University in the USA reports how the army ants maintain underground nest temperatures that are up to 13oC above ambient air and soil. This remarkable ‘central heating’ is vital because whilst ant colonies are fairly mobile the pupae of developing ants are not and require a relatively warm temperature to develop. These warm nests allowed ants to live at relatively high altitudes of up to 1565m. Scientists calculated that the metabolic activity of worker ants was sufficient to generate this heat, although the ants would have to be very active and so this may be an altruistic behavior where they sacrifice their own chances of survival to protect young. Pigs get a bad wrap in my view, they are not the filthy dumb animals they are so often portrayed to be but are in my view rather clever and appealing, and would make far better pets than many dogs I can think of! Now science has proven I am right with the revelation that what may sound to many like unstructured ‘grunting’ by domestic pigs is in fact a complex form of ‘acoustic signaling’ (science jargon for talking)! 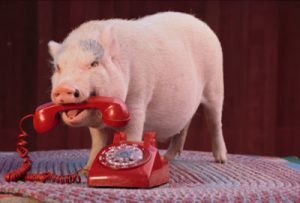 A new study published in the Royal Society journal Open Science shows that this is highly related to personality and communication in domestic pigs, and behavioural studies with over 70 piggy test subjects proved that not only do pigs exhibit clear ‘personality’ traits that are vocalised, but they also vary in their vocalization according to their treatment and surroundings and male and female pigs responded differently to these cues. Farmers already use vocalization as a measure of animal wellbeing, but this study suggests there is much more we can learn about pigs and other animals by carefully listening to their ‘language’!